No Artist Experience Needed! Don't worry if you can't draw, all you need is love in your heart. Community organizations are instrumental in helping us bring beautiful murals in to as many institutions as we can. Paint-a-Mural events are entertaining, stress-relieving, and a great way to bond with local community members. Just think of the smiles that you will put on the children's faces, and you will know that you want to help. 1: Choose a mural sketch from our Sketch List. 3: We print the canvas design onto a canvas and ship the canvas and the paint out to you. Paint Brushes aren't supplied by us, but you can pick up cheap paint brushes at a Dollar Store. 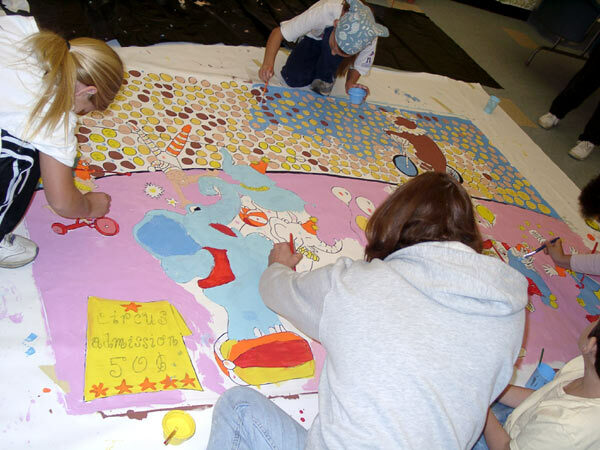 4: You and your group members paint the mural. 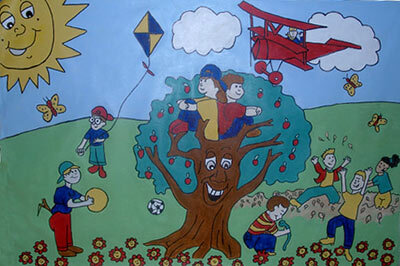 5: We donate the mural to the charity of your choice and you make a lot of kids very happy. If you are a company or corporation we can contact the media for you so you get some nice press coverage from your good deed. **We are no longer holding Paint a Murals because of the below reason...however, there is no reason why you can't hold a Paint-a-Mural on your own. You can get canvas, use a projector to project the sketch on to the canvas, have a mural party, and then donate the mural to the hospital or charity of your choice. CHANGES TO ARTISTS HELPING CHILDREN - PLEASE READ - Artists Helping Children is No Longer Acting as a Nonprofit Due to the New Provisions of The Pension Protection Act of 2006 Passed on August 03, 2006. We Are No Longer Accepting Donations of Any Kind. We are Currently Keeping This Site Up As Is and Will Continue to Post Information on Any Updates to the Status of Artists Helping Children. The Site Still Has a Wealth of Information and Can Still Be Used as Such. We Are Obviously Deeply Distressed Over This Provision That Was Secretly Included In This New Law and We Were Taken by Complete Surprise. We Hope in the Future That We Will Be Able to Change the Status of Our Organization so That We Can Once Again Resume Our Help to Children. Thank You Very Much to Everyone Who Has Worked With Us So Hard Up Until Now. Please Continue to Use This Site for Free Coloring Pages / Printouts, Arts and Crafts Project Ideas, and as a Resource for Childrens Art Articles, etc. Don't worry, All donations of items that were sent to us will still be sent to hospitals and shelters, etc. All recent checks sent to us will be mailed back to you. Thanks. Offices, Hotels, Hospitals, Retirement Homes, Retirement Communities, Schools, Camps, Malls, Stores, Girl Scouts, Boy Scouts, Sports Teams, Bands, Clubs .... ANYONE!!! Charity Teddy Bear Making Party NEW! !- Do you want to brighten up the day of a sick child? How about holding a Charity Teddy Bear Making Party. Gather up your friends, classmates, coworker, birthday party invitees, or other person ... Make and stuff a teddy bear for a needy child. Find out what wonderful things can happen when people come together with love in their hearts .... hold a Bear Making Party and you will see.